Singapore’s Ministry of Manpower (MOM) released its Conditions of Employment 2018 report on 16 January 2019, stressing the importance and impact of workplace practices on staff turnover. In ranking the workplace practices that impact staff resignation rate the most, it was revealed that flexible work arrangements had the greatest impact, followed by annual leave entitlement, work week patterns, non-statutory leave, and sickness absenteeism with the least significant impact. According to the report, more establishments are offering flexible work arrangements, and in greater variety. 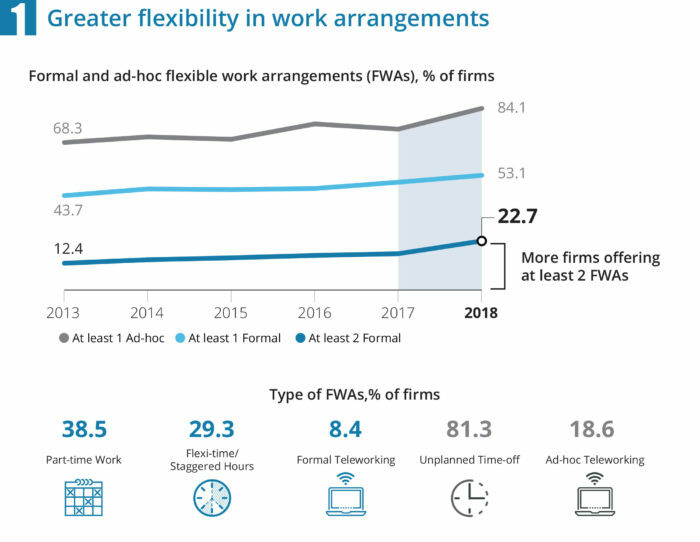 Per the ranking results, having flexible work arrangements that accommodated and provided employees with flexibility played a key role in reducing employees’ tendency to resign. This was especially so for employees with important commitments, for instance family responsibilities. In turn, companies can retain and attract employees, thus getting to tap on a wider pool of talents. The report stated the minimum days of annual leave entitlement had the second highest impact on resignation rate, as having sufficient breaks from work is intrinsic to employees; well-being. Companies can sustain competitiveness by pre-empting resignations that are within their control via the provision of an adequate number of annual leaves. This allows employees to rejuvenate and work at their best condition while being satisfied with their entitlements and by extension, their workplace. According to the survey results, more employees work a five-day work week across all industries. Those who work more than five days were more likely to contribute to the company’s resignation rate. In fact, having a high proportion of employees working more than five days a week was ranked fourth in its impact on the company’s resignation rate. The report also highlighted that although work-week pattern is contingent on business operations, making adjustments to accommodate employees’ needs can lower staff turnover. 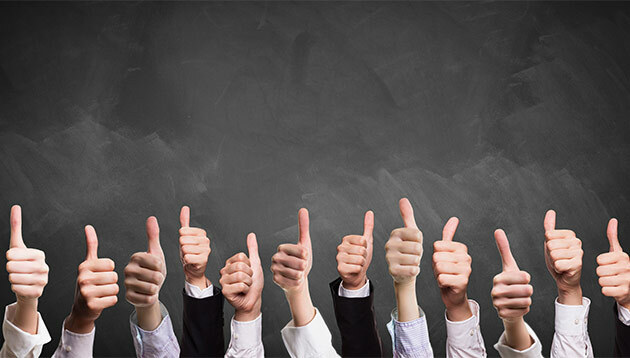 Results of the survey suggest offering non-statutory leave, and in greater variety, may help to reduce resignation rates. 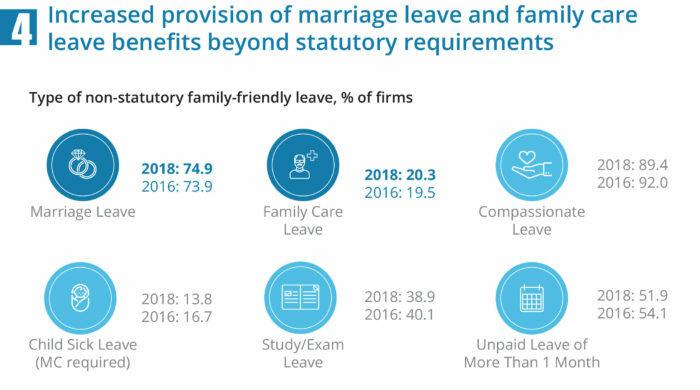 Employees are less inclined to be dissatisfied with firms that actively take steps to accommodate their needs by providing them with leave benefits beyond what is mandatory. 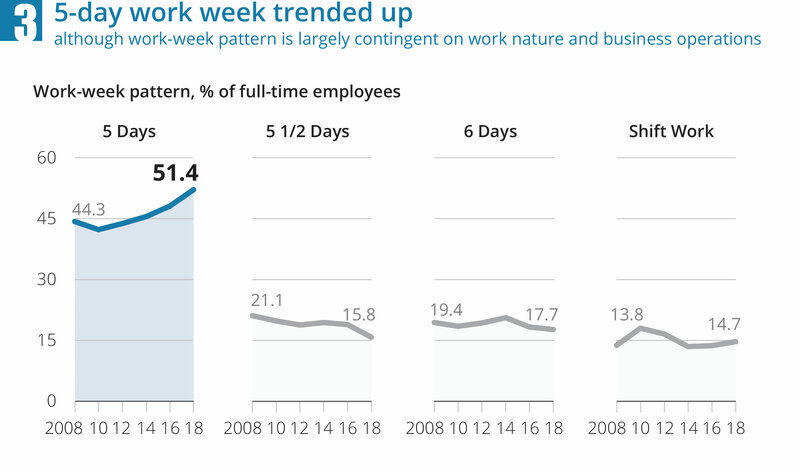 While firms were more progressive with the provision of FWA, annual leave entitlement, and work-week pattern, the proportion of firms offering at least 1 non-statutory leave remained unchanged at 96% in 2018. Nevertheless, most firms offered leave benefits beyond statutory requirements. The report was built mostly on data from the Conditions of Employment Survey 2018. conducted by the Manpower Research and Statistics Department and covering establishments from both the private (each with at least 25 employees) and the public sector. A total of 3,700 establishments employing 1,301,400 employees responded, yielding a response rate of 91.4%. Professions that top the list are often thankless jobs that require frequent or difficult interactions with the public or with cli.. The scheme, scheduled for 2018, aims to provide financial aid to jobless and under-employed Malaysians. ..